I have tried doing it without these things and I DON'T recommend it! Some people recommend washing and ironing your fabric before you cut- I definitely recommend ironing, but I don't wash the fabric. I don't really have too much of a reason, other than I am lazy. Once you have all your supplies and fabric-- have at it! If you have a pattern- cut as directed. If you don't have a pattern- have fun! Some of my favorite quilts are made without a specific pattern. And that's about it. 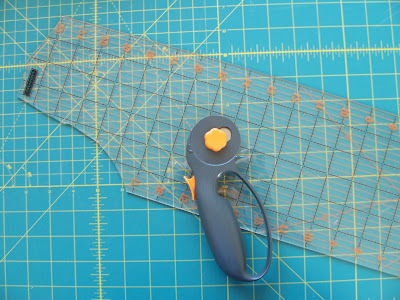 Last little tidbit to leave you with-- the more accurate your cutting, the easier the sewing and quilting. I am sorry, don't all rulers look like this? Mine sure do!!! It comes from having God's two footed blessings running around interested in everything that I do!! That's gorgeous! I'm going to start saving my scraps. I found this via the photo you posted in the One pretty THing FLickr pool, thanks so much for uplaoding that. I love color and this is a very clever use of a scrap stash.